You moved here. Now what? This blog is a book! 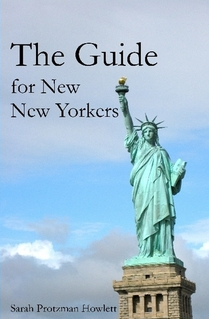 BROOKLYN, Feb. 25 — The Guide for New New Yorkers is out, y’all. Click here to purchase your copy at 20 percent off (sale starts this afternoon) for its debut week ONLY, and scroll down for the full table of contents. More about the Guide: The advice you’ve come to rely on now fits in your purse or briefcase. 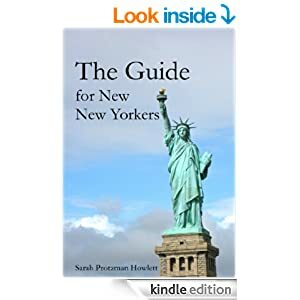 Based on the most-read posts from NewNewYorkers.info, The Guide for New New Yorkers goes beyond guidebooks and Google to help young professionals build a happy life in their adopted city of New York. Writer/editor Sarah Protzman Howlett humorously parlays her own New York journey into an encouraging book of essays, advice and practical lists. 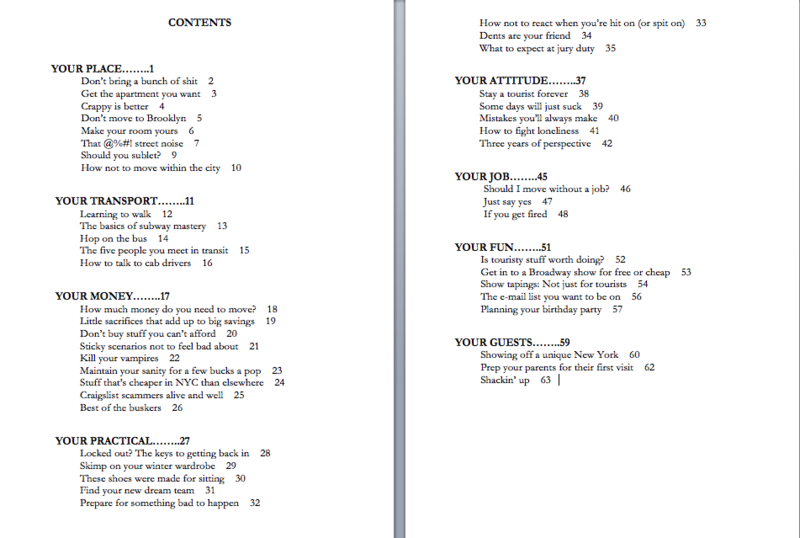 Click the image to enlarge the table of contents. On a personal note, I never would’ve done this second book without your wonderful support for my 2009 memoir, Two Years in New York City. Thank you, readers, family and friends. Why go to the theater as a transplant New Yorker? Isn’t that for the olds? Absolutely not. And here’s why. I moved to New York City at 25 and made just $30,000 a year, and I still saved for theater tickets. All of a sudden I could hop on the train and be in my seat at a Broadway show in 20 minutes? I was beside myself — and I knew I’d rather spend extra money on experiences than things. 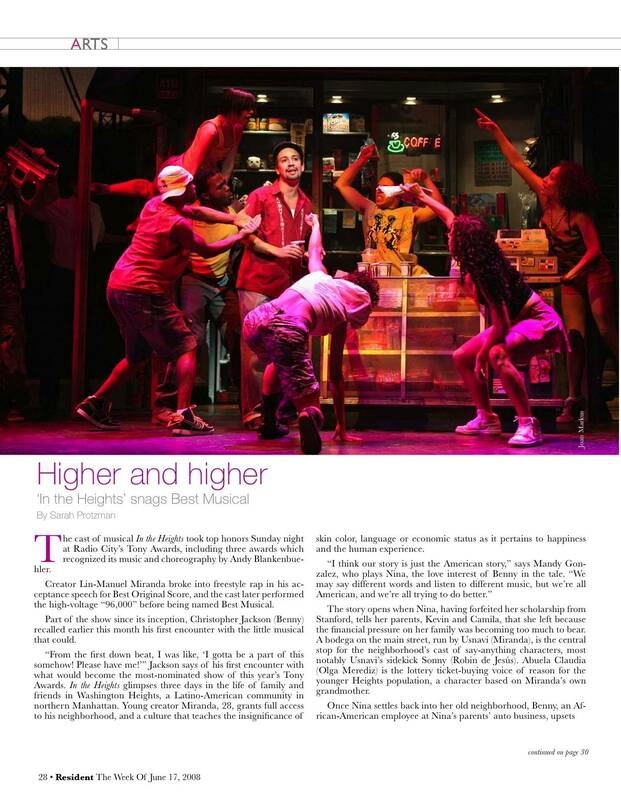 As I write this, IN THE HEIGHTS is closing — a show I was privileged not only to see twice, but also to cover as a freelance writer. Miranda has said that, as a younger man, he didn’t realize “you could write about the present.” For those who perceive musicals as cheese with melted cheese on top, musicals like In the Heights, Rent and Next to Normal are a nontraditional portal into the genre. As a transplanted local attending a Broadway show, both your dreams and the dreams of the actors are coming true at the exact same moment. After all your months of planning for NYC, there’s an undeniable link between you and those who’ve dreamed about being on that stage since they were five*. You both know just what it’s like to chase down a dream. Need more tips on snagging theater tips? Read this and learn how to pull some strings. You moved all the way here to experience something different. Forego a night at the bar every couple months and spend the money to see a show. It’ll feel fantastic. Recently I wrote a response to this post, which appeared on NYC Recession Diary, giving my own spin to a list of must-knows about life in the city. As you all know, when asked for advice from my readers, I’m always going to come down on the side of non-jadedness, spending wisely and bucking every cliché New York City has ever seen. Because why not? 1. Walk fast. On the right, preferably. Bonus points for doing it without simultaneously texting. 2. This is a very expensive city, but what you spend and save is all about choices. The misery of credit card debt isn’t worth the fancy stuff we tell ourselves we deserve. 3. When you’ve been well-treated by anyone in customer service, the post office, the DMV or the drug store, a simple “Thank you. You’ve been very helpful” will make their day. 4. Get tested. Momma didn’t raise no fool. 5. Tempting as it may be, don’t talk back to cat-callers, rude pedestrians or anyone not acting the way you think they should. First of all, they don’t care what you think. Second of all, you never know who’s crazy, on drugs or carrying a weapon. 6. People here tell amazing stories. “How long have you lived here, and where are you from originally?” are great questions to get to know neighbors, new friends and coworkers. 7. Bike messengers and cabs appear to feel exempt from traffic laws. Never assume they will yield, see you or stop when the light turns red. 8. If you get into a livery cab, the only place you’re going is Rip-Off Central. 9. The bus is a great way to go crosstown, get your bearings and see the city — and the perfect way to escape the sweltering subway in August. Metrocard transfers are free between the bus and subway within two hours of when you first swiped. 10. Invest in a good pair of rain boots, and keep shoes at your desk to change into. 11. Hand sanitizer and public transportation are a match made in heaven. 12. Genuine is the new snarky. You don’t have to be a stereotype to make it here. I promise! 13. When you go out for group meals, ask for individual checks. The inevitable “If everyone paid, how are we still $100 short?” is a recipe for awkwardness among friends. 14. Look up, and look around — often. This is advice everyone gives, because it’s the best. 15. Don’t give money to anyone who stands there and shakes a cup. Do give to the singers, dancers and instrumentalists. 16. It’s OK to ignore the guilt-inducing folks with clipboards. You don’t have to talk to them to prove you care about the environment and education. 17. Don’t throw yourself between the closing doors to make the subway. It pisses people off, plus it hurts a lot. 19. Give a copy of your keys to someone you trust. Being locked out at 3 a.m. in the dead of winter is not smiles times. 20. Pay attention to your fixed costs. Having a super-swank apartment isn’t as much fun as having money to go out. 21. Don’t wear shoes in your apartment. Do you really want dog pee, poop and loogies on your hardwood? Just land? Read these first. 1. How much money do I need to move to NYC? 3. Don't move to Brooklyn. Please. 6. Should I move without a job?